La Balconada en Madrid es un restaurante situado en uno de los edificios con más historias de la plaza Mayor de Chinchón, en una casa antigua que conserva toda la belleza de la arquitectura popular de la ciudad. Aquí puedes comer disfrutando de vistas maravillosas desde los balcones que dan nombre al lugar, foie de paisaje sobre lienzo, el almuerzo del abuelo y pepitoria de gallina son sólo algunos de los originales platos de la cocina típicamente castellana que encontraremos en este local. Celebra tus actividades especiales en los salones privados que te ofrecen, contando siempre con un servicio de calidad, no dudes en visitarlos. Great location and environment with a view directly to the Plaza Mayor of Chinchón. The food, incredibly tasty is prepared with fresh high quality ingredients. The service is pleasant and overall good. Gran experiencias. Asados sublimes. Súper aconsejable! 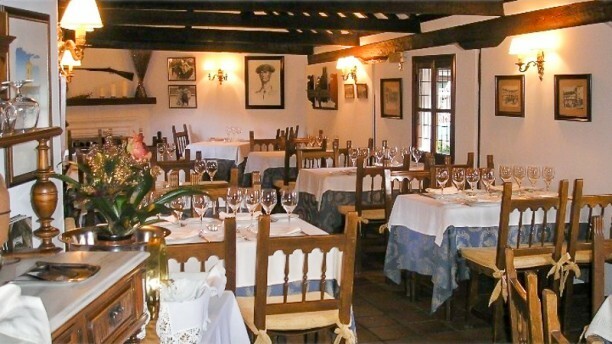 If you are ever in Chinchón, this is the place to eat. The decor is great, as are the food and service. Views over the square are lovely. Prices are at the top end, but well worth a treat. €140 for 3 with wine and desserts. Excellent lunch. The service was perfect and the recommendations of the crew were quite adequate. Great food and excellent service ???? En un ambiente tranquilo un trato estupendo. Outstanding food: best quality of ingredients and preparation of the dishes. Great location, superb view and nice atmosphere. Its expensive relative to other Spanish restaurants but definitely worthy every euro! We will repeat for sure! We were told that the 20% discount did not apply because it was a Sunday (where did it say that?). Other than that, the experience was excellent!!!! !